Twelve hours of hands-on classroom instruction in a small classroom setting! Taking the photograph is only half of the photographic process. In the "old days" of film, serious photographers used darkroom techniques to perfect their images. Today, we use software. 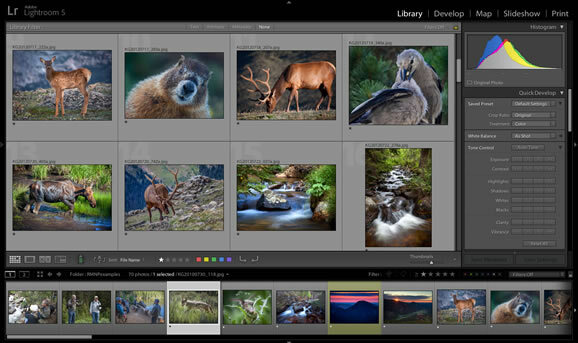 Adobe Lightroom is an excellent tool for helping photographers create outstanding photographs! SPECIAL BONUS FOR LEARNING LIGHTROOM AND PHOTOSHOP! - A total of 30 HOURS of very hands-on small classroom learning! SAVE $150! Our best discount EVER! We add more classes throughout the year, based on student interest. We want to hear from you! Learn techniques for effectively managing and organizing the thousands of photographs you take with your digital camera. Then learn the many ways this amazing tool can be used to adjust your images to move them from "good" to "great"! "I just finished a Lightroom class with Kevin. It was fabulous! Kevin presented Lightroom in an organized, easy to understand, and enjoyable way. He is a an absolute professional with his presentations. All attendees in this class were beginners with the program. Kevin's curriculum is organized in a logical manner that takes the students through all the basics and beyond. He is hands on and took questions through out, including coming around when needed to help the students by providing individual assistance. He would direct the students to the correct tabs and get them on track again. I am thrilled with my new skills in Lightroom! I plan to take many more classes with Kevin." 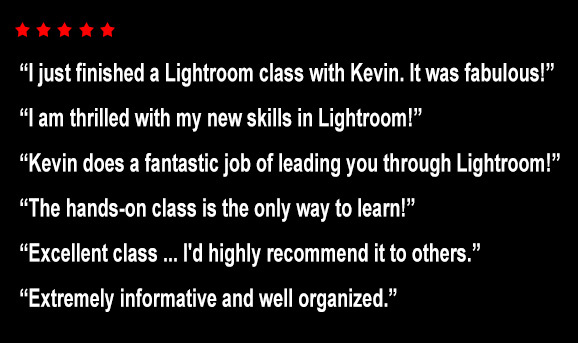 "Kevin does a fantastic job of leading you through Lightroom! The hands-on class is the only way to learn! I'm looking forward to putting all this new knowledge to work!" "This was an excellent class and I'd highly recommend it to others. Kevin's class was well organized, well paced, and left me with the ability to use the program effectively." Explain the CONFUSING differences between the new Lightroom CC and Lightroom Classic CC and their "Creative Cloud"
Using the power of "Collections" and "Smart Collections"
Understand the ways Lightroom stores "metadata"
Adjust your images for the best color, contrast, white balance, highlight detail, shadow detail, etc. Selective adjustments to portions of an image using a "brush" or "graduated filter"
Create different variants of the same image using "virtual copy"
Note: Lightroom now has two versions: Lightroom Classic CC and Lightroom CC. This class covers Lightroom Classic and earlier versions. Class Format - 12 Hours Total! The workshop is presented in my studio in NW Austin. Class size is limited. We meet for 3 hours each session for 4 sessions. Kevin will provide instruction and activities you will put into practice in class on your own computer. Are you using Windows or a Mac? No problem! Either is fine! Make sure you bring your power adapter for your computer. Once you have been a student of one of my classes, you are invited to future photographer social get-togethers at my studio (for free), such as our Potluck Slideshows. Also, as a former student, you are welcome to email me any time with any other photography questions. Perfect Gift for That Photographer in Your Life! Cancellations made more than 21 days prior to the class start date, will receive a refund of the workshop fee minus a $50 cancellation fee. Cancellations made 7 to 20 days prior to the class start date, will receive a refund of the workshop fee minus a $120 cancellation fee. Sorry, no refunds will be made for cancellations made less than 7 days prior to the class start date. Your registration for this class indicates your agreement with these terms and conditions. "Kevin's class is well organized and proceeds at an appropriate pace. The key concepts and topics are well covered and provide the student a solid orientation for more detailed self-study where needed. The small class size facilitates questions and individual attention. Kevin is an effective teacher." "Extremely well-organized presentation simplified a very complex software package and made understanding much easier." "I wanted to thank you for a great Lightroom class. I was somewhat familiar with the develop module, but nothing else. It really helped. ... I hope I can do more classes with you." "This was a great class in a nice, relaxed atmosphere. This was my 3rd class taken from Kevin; he is an excellent, patient teacher." "With this class, Kevin is giving photographers an introduction into the second and equally important side of photography: dealing with your images once you've taken them, and using the tools available to ensure they are as good as they can be once out of the camera. As is true of all Kevin's classes, they are well prepared, organized, the information is presented in an engaging format and in a logical progression that leads to one "AH HA!" moment after another. I highly recommend it." "Kevin's classes offer new photographers the opportunity to dive deeper into the fundamentals of photography and the tools and techniques to improve your skills. I have taken two classes now and enjoyed them both tremendously!" "Once again, another awesome class!" "The Lightroom class was great. Even though I have mainly used the Library module for organizing my photos for a while I learned a lot of new features about the Library. The hands-on practice in the Develop module gave me a much better understanding of its capabilities. Kevin is a wonderful instructor and does not hesitate to share his knowledge of photography." "I loved your notes and that you follow the outline. It makes taking additional notes so easy. I also liked how it progressed in a logical format." Which features of Lightroom do you feel you now have a better understanding? "All of it! I know I would have been lost from the beginning if trying to do it all on my own. I loved how you gave us the shortcuts too." "Enjoyed the class a lot and learned quite a bit!" "Kevin is an excellent instructor!" "I love Kevin's workshops! He is so patient, and welcomes questions. Never talks down to you. He genuinely cares about helping students learn."